North South Face to Face Sitting Arrangement Puzzles are being more often in Bank Exams which can be solved easily by using Reasoning short cut tricks. These questions are long statement questions based upon condition/ situation of statement. Reasoning Short cut Tricks are only fastest method to solve South North Face to Face sitting arrangement puzzle questions. The Short cut trick discussed is easy to memorize and use for the candidates in any bank exam. Puzzles are the most important part of reasoning section of SSC IBPS or any other competitive exam which covers 10-15 questions help to achieve cut-off score. Puzzles are of many types i.e. circular, position or sitting arrangement, complex circular sitting arrangement with occupations. Straight & Front Sitting Arrangement Puzzles are very easy to solve but sometimes it becomes confusing and time consuming. Most of the students leave this section due to lack of practice. It is recommended to the aspirants to attempt puzzle on the priority basis to assure cut-off marks in SSC IBPS or other competitive exams. REVERSE METHOD is one of 100% accurate and reliable methods to solve such 10-15 questions in 3-5 minutes only. 1. Count all objects and draw a circle. Mark all position with arrows facing each other (updward & downward directions) in the TWO PARALLEL STRAIGHT LINES (see example for clarity). 2. Read the statement line by line from right to left FOR OBJECTS sitting FACING NORTH which shows condition is favorable to us and from left to right FOR OBJECTS sitting FACING SOUTH which shows condition is unfavorable to us (see example for clarity). 3. Take two lines together to display result (combined form). 4. Always start from left end of the figure. 5. Put cross mark (x) mark for vacant left and right positions (see example for clarity). 6. Put first object on the suitable position convenience to the statement provided. 7. Check and verify all the positions according to statement. Twelve persons are sitting in two parallel rows containing six people each in such a way that there is an equal distance between adjacent persons. In row -1 A, B, C, D, E and F are seated and all of them are facing South. In row-2, P, Q, R, S, T and V are seated and all of them are facing North. Therefore, in the given seating arrangement each member seated in a row faces another member of the other row. V sits third to right of S. S faces F and F does not sit at any of the extreme ends of the line. D sits third to right of C. R faces C. The one facing E sits third to right of P. B and P do not sit at the extreme ends of the line. T is not an immediate neighbor of V and A is not an immediate neighbor of C.
1. Total Objects =12 in which 06 in Row-1 & 06 in Row 2. 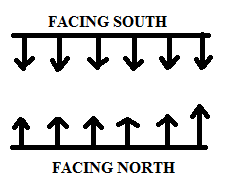 Draw two parallel straight lines with arrows total six Upwards direction (shows objects facing North) and downward direction (shows objects facing South). Mark all position of objects in these two parallel straight lines same as shown in step 1 in Figure 1 provided at the top of the page. Those objects that represent upward direction (Facing North) say P, Q, R, S, T, U and V are favorable to us and those objects that represent downward direction (Facing South) say A, B, C, D, E and F are unfavorable to us. Take P, Q, R, S, T, U and V to bottom parallel straight line facing north and A, B, C, D, E and F to top parallel straight line facing south same as shown below figures. 2. Read the statement line by line (right to left) and write the arrangement as per statement. Now put V at the extreme ends of at the bottom arrows of straight lines. Then put S third to the left of V facing F on the top line (facing downward arrow) same as shown in Step 2 in Figure 2.
b. D sits third to right of C. R faces C.
c. The one facing E sits third to right of P.
Now put P in appropriate position so that third to the right will be ? which will face E. Thus appropriate position of P will be second to the left. Now Put P, ? and E same as shown in Step 3 in Figure 2. Now put D in appropriate position so that third to the right is C faces R. Thus appropriate position of D will be first to the left in the top straight line. Now Put D, C and R same as shown in Step 4 in Figure 2.
d. B and P do not sit at the extreme ends of the line. In this case position of P is verified at the extreme ends and B is to be searched which is found second to the left of top straight line facing south same as shown in Step 5 in Figure 2.
e. T is not an immediate neighbor of V and A is not an immediate neighbor of C.
In this case position of V is verified for neighbor T which provides the position of T i.e. at the left extreme end of the bottom straight line facing north. Now position of C is verified for neighbor A which provides the position of A i.e. at the right extreme end of the top straight line facing north. Now put Q in left position same as shown in Step 6 in Figure 2.